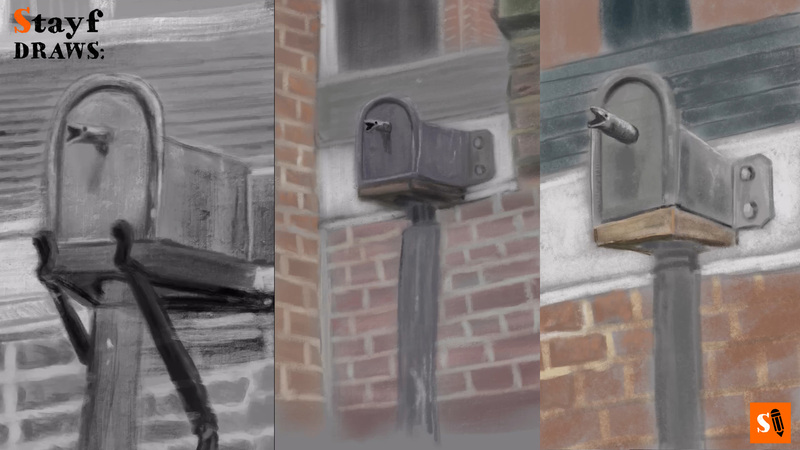 I sometimes do studies of rendering paintings in a realistic way. A good approach or way of getting better in painting realistic is to look at a picture or things that you draw in an abstract way. Try and get into a sort of a dream state where you don’t see the shapes of what you are drawing but just concentrate on the values. Here is a study of an old water drainage. I took the picture when I was walking to my study. You can see a lot of interesting things when you pay attention. This picture has four different structures or materials. They all have their own structure. The center piece is of course the water drainage which is made out of lead. The you have the bricks of the wall. The wood on which the water drainage is sitting and the tiles of the roof. For the study I used one brush to paint everything. The study I made digital with the Apple Pencil on the iPad Pro in the amazing drawing app Procreate. I am using the Gesinski Brush which has a bit of a texture. The first study I made was in grey scale so I could just concentrate on the different values. In the second study I tried to capture the same picture with using colors. In the third study I concentrated more on the perspective and used Perspective Assist to draw the water drainage in the right perspective. Studying lights and darks is great practice. It makes you look at things in a different perspective (pun intended).